Do you love the outdoors? 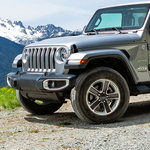 Do you believe in the old adage, “if you stay ready, you won't ever have to get ready?” If so, the new Jeep Wrangler is the perfect 4x4 for you. It's award winning Rubicon model, heavy duty axles,and smart-trac technology mean this Jeep SUV is ready for anything the road throws your way. Whether you're driving around Mechanicsburg or off-roading for the weekend, the new Jeep Wrangler has you covered. The smart trac system toggles between two and four wheel drive so you don't need to lift a finger. Travel light or bring all your gear along in a hitch, the powerful 2.0 Liter engine means the Wrangler can tow up to 2000 pounds effortlessly. If you're ready to experience a sports utility vehicle as capable and adaptive as you are, head to Faulkner Chrysler Dodge Jeep Ram FIAT and ask to test drive a new Jeep Wrangler today.